Legalized sports gambling is sweeping across the United States thanks to a recent Supreme Court decision. That's creating a once-in-a-lifetime opportunity to get in ahead of the cash windfall as different states vote to legalize sports betting. Unfortunately, the media is touting the same run-of-the-mill, has-been sports betting stocks that aren't going to make you any money. On Monday (June 11), Gov. Philip Murphy (D-NJ) signed a bill legalizing sports betting in New Jersey. 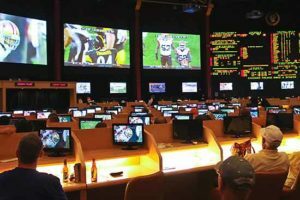 The announcement comes just weeks after the Supreme Court overturned a law barring states from legalizing sports gambling. Delaware, West Virginia, and Nevada have already legalized gambling, and more states are following suit. Naturally, the mainstream press jumped all over the story. The press began hawking any public company that could have any ties to the newly legalized pastime. CNBC and other mainstream sites have been pumping the same 20 different companies from gaming-software firm Scientific Games Corp. (Nasdaq: SGMS) to the recently bankrupt Caesars Entertainment Corp. (NYSE: CZR). But these stock prices are already inflated, and they aren't the best ways to make money. Today, I want to show you a totally different way to make money on legalized gambling. Previously, betters had to travel to Vegas or look for a black-market bookie if they wanted to place a wager on sports. Elected officials in 14 states – including California, Maryland, Illinois, and Michigan – have introduced bills to legalize sports wagering. By 2020, there could be 20 states that cash in on sports betting, syphoning money away from the $57 billion black market, all for themselves. Now, I know owning stocks in casinos and racetracks seems like the fastest way to make money. But I'm sorry, overpaying for them is not what I do. And I'm not talking about some decrepit gambling facility with cocktail waitresses in ill-fitting outfits waiting for legalized sports betting to take their casino off life support. The investment I like is one you won't hear about in the mainstream media. You see, I've figured out how to tap into the huge, billion-dollar tax streams created by this law. That's where the real money is.